If you recently ditched disposable water bottles for reusable ones...well done! You are doing the environment (and yourself) a huge favor. Disposable water bottles generate a lot of waste, and your decision helps to cut it down. Also, why spend money buying water every time you go out when you can conveniently carry your water bottle with you? Perhaps the only drawback with reusable water bottles is that they can be a little tricky to clean. The small opening makes it hard to scrub the inside, and only rinsing it is not enough to do the job. Cleaning your water bottle regularly is important to avoid unpleasant odors and taste as well as bacteria and mold buildup. Unclean water bottles can be a thriving place for germs and bacteria that may contaminate your water, leading to a number of health issues. Tossing your travel mugs and bottles in the dishwater is not a very good idea. For starters, a lot of reusable bottles are not dishwasher-safe, especially if they have a coated exterior. Using harsh, chemical-based cleaners will not only damage your bottle, but you might also ingest the residue if you do not rinse the bottle out well enough. A simple soap and water rinse may help, but to ensure that your bottle is thoroughly clean and germ-free, you need something more. What if we tell you there is another, much quicker way to do the job? DIY cleaning tabs are highly effective and easy to make and use. They work just perfect for your irregular hard-to-clean bottles as well. You won’t even need any special cleaning tools like bottle brushes. 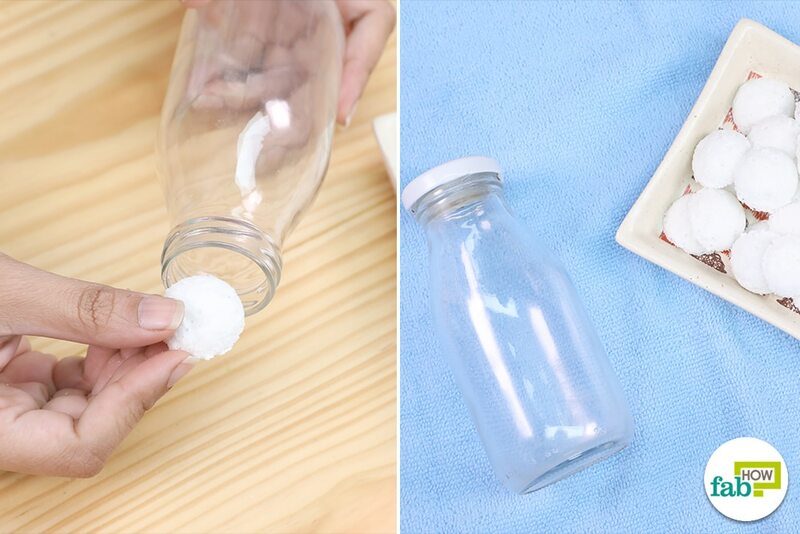 The DIY cleaning tabs for hard-to-clean bottles are the best way to give your bottle a quick but thorough cleaning. Simply toss a cleaning tab in the bottle and add some water. The fizzy tab will take care of the rest. The remedy is suitable for all types of reusable water bottles, be it plastic, glass, steel or aluminum. 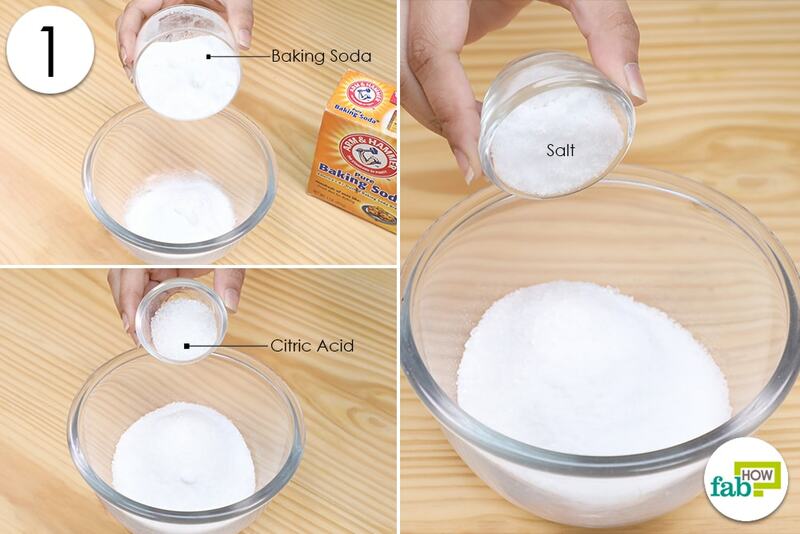 Put 1 cup of baking soda in a bowl. Add ¼ cup of citric acid. Now, add ¼ cup of salt. Add 1 teaspoon of liquid dish soap to the mix. Finally, add ½ teaspoon of hydrogen peroxide to the rest of the ingredients. Mix everything well using a wooden spoon. Spray in some water while simultaneously stirring the ingredients. Always only a spray bottle for this as adding more water than needed will affect the desired consistency, making the mixture runny. Using a small scoop, make small cleaning tabs with the mixture. Place the tabs on the baking sheet. Let the tabs dry overnight in a warm and dry place. 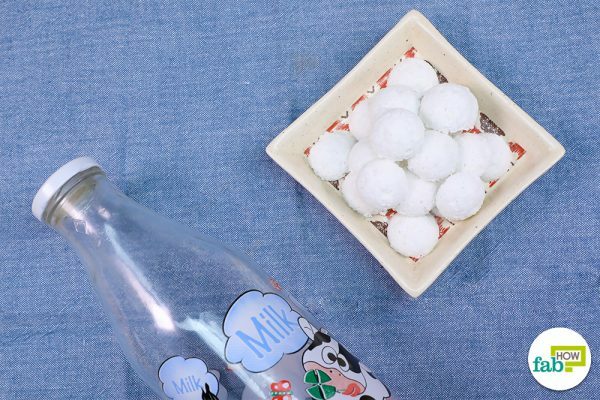 Drop a fizzy tab in a bottle and add some water to it. Let it sit for about 2 minutes till it stops to bubble. Put the cap on the bottle and shake it vigorously. Throw out the cleaning solution and rinse the bottle with clean water. Use these tabs to clean bottles, jars and other containers made of plastic, glass or metal. You can store these tabs for up to 15-20 days in an airtight container. However, while using these tabs if you see no fizz, it is time to prepare a fresh batch. Baking soda: Sodium bicarbonate, commonly known as baking soda, is an extremely versatile processed natural salt. Other than being a leavening agent for baking (as the name suggests! 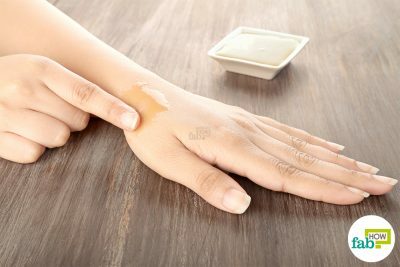 ), it is also used for health, skin care, and cleaning purposes. Baking soda is an abrasive and a mild alkaline buffer. It is also known for its odor-neutralizing properties. This ingredient can help get rid of stains and water deposits. It is often used for cleaning kitchen appliances, utensils, silverware, stainless steel kitchenware and more. Its fine grit is strong enough to clean the stains but too mild to cause any damage to the surface. Baking soda will thoroughly clean your water bottles without the need for scrubbing and also remove funny smells if any. Citric acid: Another multipurpose ingredient, citric acid is used for culinary purposes, beauty benefits and cleaning among other things. It has antibacterial and antiseptic benefits and can help get rid of tough stains and spots, soap scum, water stains, mineral deposits, mold, and mildew. Citric acid creates a fizzy effective and is often used in soaps, bath bombs, detergents, and other cleaning products. It works well for cleaning up stainless steel products, countertops, floor, appliances, clothes, taps, shower doors, windows, dishes and more. It will clean and disinfect your water bottle so that the water you carry in it remains safe to drink. This ingredient is strong, effective and absolutely safe. Citric acid causes no harm to the environment or your health. 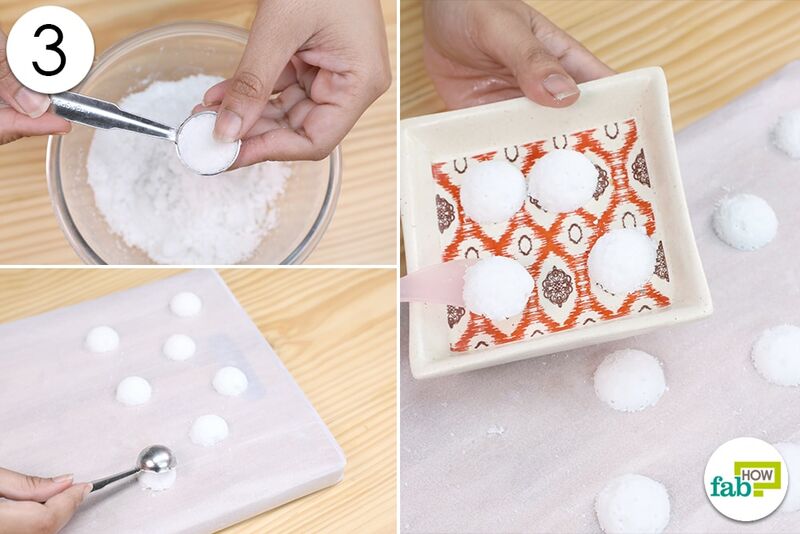 Salt: Good old table salt can also be used for both beauty and health. It is a great scouring agent and can help remove scum, grime and stains without much scrubbing. Combining salt with other non-toxic cleaning agents like baking soda, vinegar, and dish soap helps boost their abilities. Salt is an effective cleaning agent because it is abrasive, absorbent and works well in combination with acids. The sharp-edged salt grains are useful in scraping away stains from different surfaces. The amazing absorbency of salt comes in handy for ensuring liquid spills don’t end up staining the surface. Simply sprinkle some salt over the fresh spill and let it work its magic. Salt is one of the best ingredients for hard-to-clean containers, jars and water bottles. It can be used for reducing bad odors from plastic or glass bottles. Hydrogen peroxide: Lower concentration varieties of hydrogen peroxide are widely used for health and household purposes. It cleans and disinfects without leaving behind any harmful residue. Hydrogen peroxide can be used for making an antibacterial spray, window cleaner, countertop cleaner and disinfectant for counters and cutting boards. It is also good for sanitizing and deodorizing water bottles, especially plastic ones. It is nontoxic, cheap and extremely versatile. 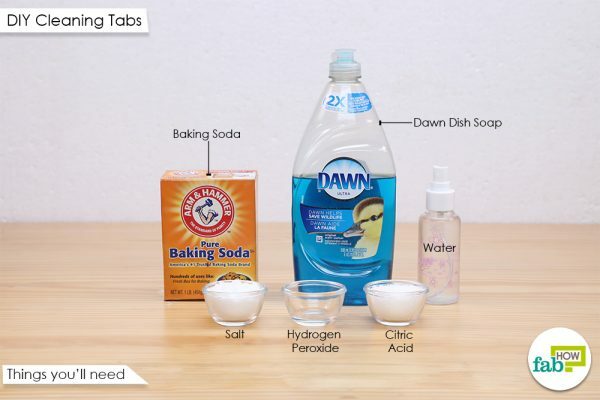 Combining all these ingredients with the mild and effective Dawn dish soap will certainly increase the effectiveness of your cleaning tabs. There will be a little bubbling while mixing the ingredients. 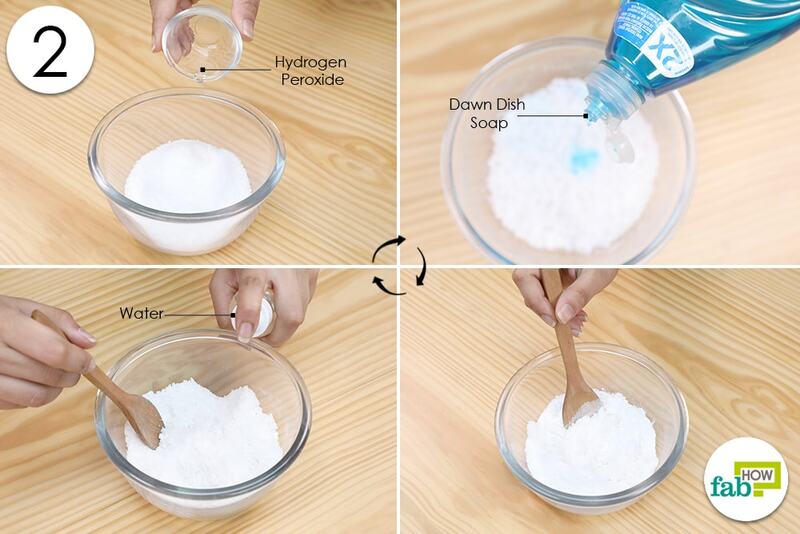 To keep the bubbling at a minimum, add the hydrogen peroxide a little at a time. You may use a melon baller instead of a scoop for shaping the tablets. Avoid using abrasive cleaning tools on aluminum and stainless steel bottles, as these scratch easily. Do not use bleach to clean your water bottles, as it can be harmful for your health. You may use a toothbrush to scrub those hard-to-reach areas inside a wide mouth water bottle. Commercial bottle-cleaning tablets contain chemicals that may affect your health. DIY cleaning tabs are a much safer option. It is best to rinse and clean your water bottles every day.